For decades Jean Claude Duvalier brutally ruled over Haiti—leading to the murder, dissapearance, and torture of tens of thousands. However, the recent decision by an appeals court on February 7 demanding Duvalier appear in court or face arrest is a small but extremely important step toward gaining justice for his many victims. 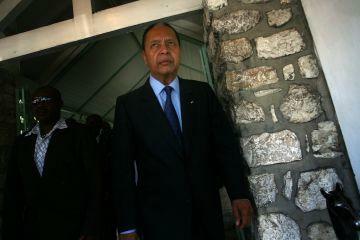 In January 2012, Judge Carves Jean triggered a wave of shock and disappointment throughout Haiti and much of the world by ruling that the former dictator of Haiti, Jean Claude Duvalier, would stand trial for the embezzlement of public funds, but not for the much greater charge of committing crimes against humanity. While it is widely acknowledged that Duvalier looted the Haitian treasury to the tune of $800 million, he has also been implicated in carrying out systemic human rights abuses, consisting of the murder, torture, disappearance, and imprisonment of tens of thousands during his rule from 1971 to 1986. Judge Jean’s decision to drop the most serious charges against Duvalier was based upon his reading of the Haitian constitution, which cited that the abuses fell outside of the 10 year period outlined in the statute of limitations. Contrary to the ruling by Judge Jean, international law states that there is no such limitation when it comes to crimes against humanity. According to Javier Zúñiga, Special Advisor at Amnesty International, "International human rights standards are very clear in cases such as this. Crimes including torture, executions, arbitrary detention, and enforced disappearances are not subject to a statute of limitations and the alleged perpetrators cannot benefit from pardons or amnesties.” It is with this in mind that Duvalier’s victims and their relatives—and the human rights and advocacy organizations representing them—appealed this decision. Without a doubt, such a self-righteous gesture was to reinforce and show the court and the Haitian people that he considers himself to be above the law—and as such can do as he pleases. This fits a similar pattern whereby Duvalier had previously missed an earlier appeals hearing on January 31, regularly and openly disregarded his conditions of house arrest—and was even recently granted the renewal of his diplomatic passport. However, contrary to letting these troubling turn of events snowball into complete impunity, Judge Jean Joseph Lebrun of Haiti's Court of Appeals accepted the rescheduling of the hearing once again, with the important caveat that Duvalier must attend court on February 21, or he would be risking arrest. Nicole Phillips, an attorney with the Institute for Justice and Democracy in Haiti explained the significance of this decision, remarking that "The hearing on February 21 could be a pivotal moment in the prosecution of Jean-Claude Duvalier. If Duvalier appears as ordered by the appellate court, it will present the first opportunity for the former brutal dictator to speak about his political violence crimes in a courtroom full of his victims and the media. If Duvalier fails to appear, the Haitian government will be under intense pressure to arrest him for violating a court order." Additionally, Javier Zúñiga has stressed that the importance of this trial cannot be understated, "It is the whole credibility of the Haitian justice system which is at stake. . . . Only by respecting the procedures in the appeal case, including thoroughly examining all evidence and hearing all the victims, will the court be able to demonstrate the professionalism and independence of the Haitian justice system." The initial dismissal of the charges of crimes against humanity was considered by many to be politically motivated. President Michel Martelly has previously mentioned the possibility of granting Duvalier a pardon in an effort at bringing about national reconciliation on several occasions. In an interview with the Washington Post in January 2012, Martelly remarked “It is part of the past. We need to learn our lessons and move forward. . . . It is time to unite the country, show tolerance, show compassion, show love for everyone . . . [we need] to reconcile the factions that have been at war.” Martelly’s soft spot for Duvalier is due to his own links with the former dictator. Despite Duvalier’s self-serving opinion on the low value of such a trial, it would be significant in regards to Haiti building itself back as a sovereign nation. It would set a precedent that even the most powerful—regardless of their wealth, connections or history—are not immune to the rule of law. The 61-year-old Duvalier would face no more than five years in prison if convicted of embezzling public funds and other financial crimes. On the other hand, a conviction of crimes against humanity could put him away for life. February 21 promises to be a significant day in Haiti’s recent history—for better or worse.